Anheuser Busch Inc. Budweiser 1957 Ad. This color July 23, 1957 ad states Where theres life, theres Bud. Next time youre drinking beer, look at the label. Does it list the ingredients. The Budweiser label does. 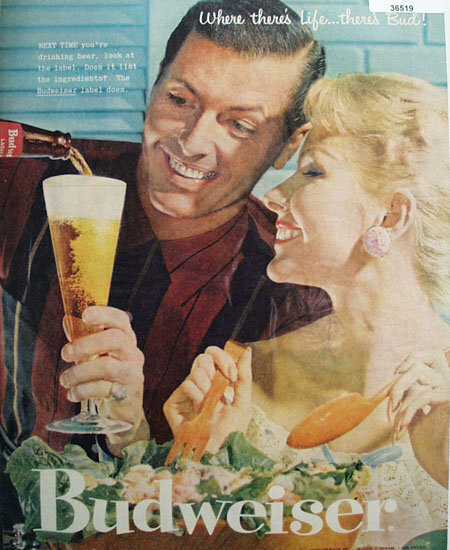 Picture shows woman eating salad and man pouring glass of Budweiser Beer. Magazine tear sheet picture is taken through plastic and may show wrinkles or crookedness that is not in the ad. This Original magazine tear sheet measures 10 1/4 inches wide by 13 1/4 inches tall.